downthetubes is sorry to report the passing of legendary American actor, writer and director Patrick McGoohan, star of the 1960s secret agent series' Danger Man, playing John Drake, and. later, The Prisoner, starring as the rebellious Number Six -- a role he never escaped. "Words alone cannot sum up the man, his career, and the impact he had on so many people's lives," The Prisoner fan group The UnMutual comments on their web site. "Everyone involved with The Unmutual Website is in shock, and extend their sincerest sympathies to Patrick's friends and family." 80 year-old McGoohan, who was raised in Britain, died Tuesday in Los Angeles after a short illness his son-in-law, film producer Cleve Landsberg, said earlier today. McGoohan's film and TV credits are numerous, including Braveheart, The Scarecrow of Romney Marsh, Ice Station Zebra and a rather ironic portrayal of the Warden in the Clint Eastwood film Escape From Alcatraz, episodes of Columbo and more. The Guardian, among others, notes that in his youth, and later, he was also an accomplished theatre actor. The Daily Telegraph notes his role as John Drake in the hugely-popualar Danger Man, who worked for the British Secret Service and spoke in clipped tones. "His (then-novel) gadgets included tie pins equipped with cameras, cherries containing microphones and electric shavers that doubled as tape recorders. 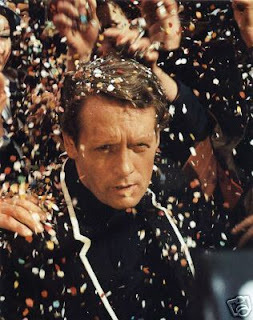 McGoohan, who made 54 episodes of the show, was eventually earning £2,000 a week, making him Britain's highest paid actor. His stock was so high that he was offered the roles of James Bond and Simon Templar (The Saint). He turned both down." The series was adapted into comics in the 1960s in both the UK and the US. He never, however, quite freed himself from the role that followed his time on Danger Man, as Number Six in The Prisoner, playing a mysterious, resigned former secret agent who is always trying to escape from the Village, an apparently congenial community which is in fact a virtual prison for people who know too much. The show is a cult classic, currently being re-made by AMC. 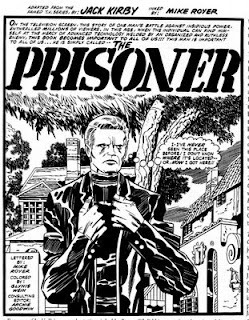 Like Danger Man, the show- once described by The Los Angeles Times as "an espionage tale as crafted by Kafka" -- has also had its comics incarnations: Jack Kirby drew an unpublished 17 page adaptation re-telling part of the first episode, Arrival, for a planned Marvel Comic, and Gil Kane pencilled a Prisoner debut issue Marvel also commissioned and never published. DC Comics published The Shattered Visage, a four issue sequel to the show by Mark Askwith and Dean Motter, in the 1980s. In a 1977 interview, McGoohan revealed he originally planned to make just seven episodes of the show. "Seven, as a serial as opposed to a series," he told writer and TV host Warner Troyer. "I thought the concept of the thing would sustain for only seven, but then Lew Grade wanted to make his sale to CBS, I believe (who first ran it in the States) and he said he couldn't make a deal unless he had more, and he wanted 26, and I couldn't conceive of 26 stories, because it would be spreading it very thin, but we did manage, over a week-end, with my writers, to cook up ten more outlines, and eventually we did 17, but it should be seven." You have to wonder which seven episode comprise his original vision. McGoohnan rarely talked about the show or what exactly it was all about, its various stories the subject of much debate ever since it was first broadcast. In later life he seemed to resign himself to his connection withthe series, reprinsing his role in an episode of The Simpsons, in which Homer concocts a news story to make his website more popular, and he wakes up in a prison disguised as a holiday resort. Dubbed Number Five, he befriends Number Six and escapes with his boat. • The UnMutual site is to set up a special page for fans and admirers to leave their tributes, click here to email yours. Steve Ross argues the rest of McGhoon's career may never have matched The Prisoner, but in that one iconic show he opened television up to new possibilties, describing the show as the "Citizen Kane of British TV – a programme that changed the landscape, and quite possibly destroyed its creator." "...The Prisoner was a television show of ideas -- the inalienable if inconvenient right to self in a world that demands your cooperation, if not capitulation -- which also distinguished it from pretty much every other television show I had ever seen." "Robert J. Thompson, founding director of Syracuse University's Bleier Center for Television and Popular Culture, said of The Prisoner that it 'was an early taste of really complex, literate, thematically dense programming' at a time when most Americans were used to talking horses, genies as hapless homemakers and courtroom shows where Perry Mason wins every case." Interestingly itv4 have only recently started repeating The Prisoner again. It still stands up as great tv even 40 years later. Good News on Comic Sales?